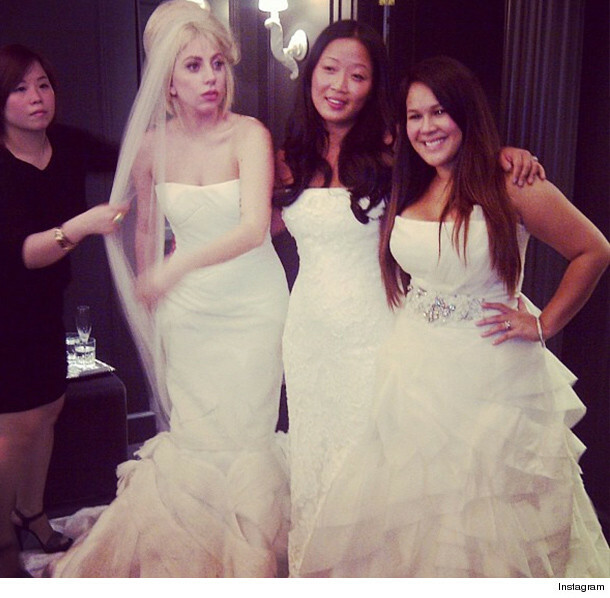 Is Lady Gaga Getting Hitched? See Her in a Wedding Gown! We've seen Lady Gaga don all kinds of crazy outfits over the years, but we've never seen her like this -- it's Gaga in a wedding gown! "It's my best friends wedding she made us try on dresses! BRIDESMAIDS VERA Baby"
Ok, so maybe Gaga herself isn't about to walk down the aisle just yet, but making friends with the famous wedding dress designer early on could prove helpful if she and her "Vampire Diaries" beau Taylor Kinney decide to make it official! Mother Monster recently shared a very intimate pic of the couple, so who knows, maybe we'll hear wedding bells for Gaga very soon! And for a trip down memory lane of some of the "Born This Way" singer's most outrageous outfits, click "Launch Gallery" below.